Flap gouge auger for depth specific sampling in dry or wet material, standard set for sampling to a depth of 2 m The flap gouge auger is an apparatus for depth specific sampling in dry or wet firm material. The slender construction enables easy penetration of (top) layers. In this way the sample can be taken at a specific depth. This construction, however, makes the flap gouge auger not suited for use in hard soils or similar material. The flap gouge auger is very useful for taking samples in drums, tanks, bags and big bags from for instance powder, grain, granulates (< 3 mm) and pastes. 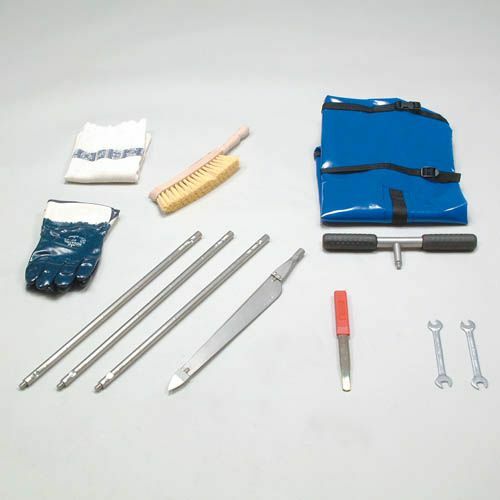 The standard set, among other items, consists of: a stainless steel flap gouge auger, a top piece, extension rods and various accessories. The whole can be transported in a solid carrying bag.